Physiotherapy / Rehabilitation is a non-invasive approach to managing pain and facilitating recovery. It can be effective for dogs with chronic or acute conditions resulting from accidents, injuries or surgery. A physical rehabilitation programme is tailored to the needs of the individual animal. It usually combines several treatment modalities, for instance acupuncture, veterinary chiropractic, heat and cold therapy, electrotherapy and hydrotherapy to improve the dog’s circulation, flexibility, range of movement, gait, posture and balance. The Chapel Farm Rehab staff are qualified and experienced in a range of canine rehabilitation therapies. As a team they work together to deliver integrated rehabilitation programmes that offer the best possible care for their patients. All new patients are given a full physical rehabilitation assessment before beginning any treatment. The outcome of this assessment is a rehabilitation programme designed to address the individual needs of that dog. Over the course of the rehabilitation there are regular progress evaluations, on-going liaison with the referring veterinary surgeon and, if necessary, treatment refinements. Hydrotherapy is based on doing therapeutic exercises in warm water. It can be used to treat or manage a variety of conditions. A carefully targeted hydrotherapy programme can relieve pain, relax tight or spasmodic muscles, tone flaccid muscles, boost joint function and improve physical coordination. The hydrotherapy provision at Chapel Farm includes an underwater treadmill and a large swimming pool. These facilities make it possible to provide well-rounded treatment programmes that include the most appropriate hydrotherapy for each dog’s condition. The hydrotherapy pool at Chapel Farm is large, measuring 10 by 6 metres. This generous pool size allows the dog to relax and move naturally. It also lets the therapist accompany the dog in the water. The pool is accessed by a ramp. This helps the dog to enter the water easily. It also lets the therapist perform additional spot treatments, such as massage, when required. The water in the hydrotherapy pool is heated to 29-30 degrees centigrade. This warmth ensures the dog is comfortable and enhances the therapeutic effect of the exercises. 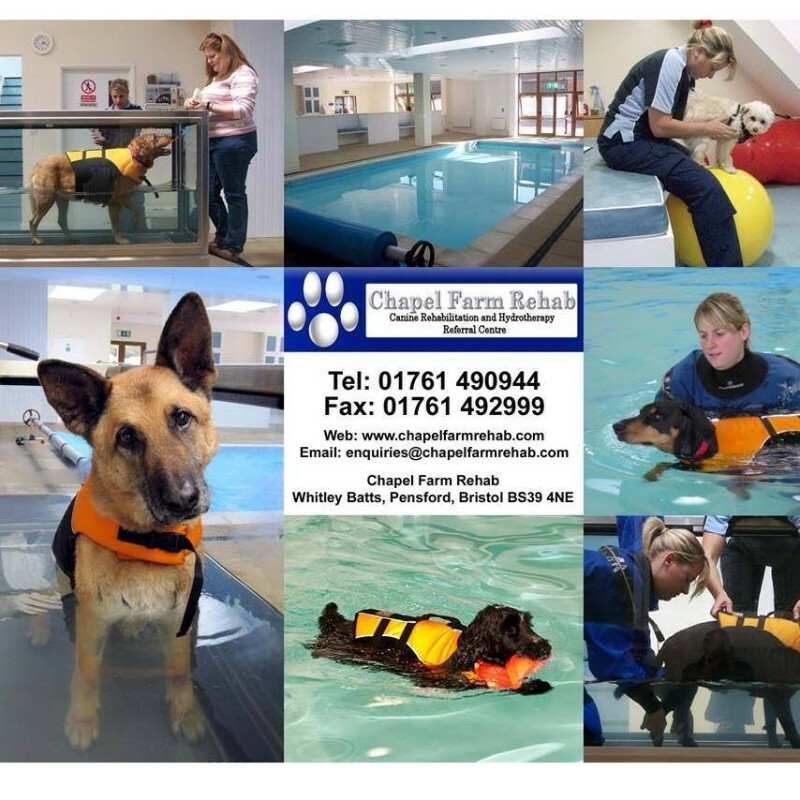 The underwater treadmill at Chapel Farm is specifically designed for canine rehabilitation. It provides a controlled environment in which the dog walks continuously through shallow water. The water depth, treadmill speed and walk duration can be varied according to each animal’s needs. The dog can be viewed from all angles while using the treadmill. Observing how the dog walks in water allows the therapist to fine-tune its gait assessment and treatment programme. Acupuncture and herbal medicine are complementary to conventional medicine, not alternatives. They are elements of an integrated approach to healthcare in which all aspects of the patient’s well-being, including diet, lifestyle, and emotional state, are considered. Acupuncture is the insertion of fine needles into key points of the body. The needles are single use and sterile. The stimulation of the needles modifies pain perception and releases certain hormones. This can improve the animal’s sense of well-being, break the self-perpetuation of chronic postural problems, normalise body chemistry, support rehabilitation and improve disease resistance. Most dogs respond well to acupuncture. Herbal medicine is the treatment and prevention of disease using plant extracts. Preparations of a single plant may be used for some conditions. Generally, however, bespoke preparations are formulated to address the specific needs of each individual dog. Veterinary sports medicine is concerned with the diagnosis and treatment of conditions affecting the athletic performance of animals. Sports medicine may be of benefit to any animal, but the majority of patients are dogs involved in competitive activities or physically intensive work. Knee, shoulder and back injuries are common. Veterinary sports medicine aims to improve the dog’s physical fitness, gait, posture and overall body performance to help prevent injuries, and facilitate recovery if they do occur. Canine touch is a set of gentle movements applied to soft tissues including muscles, fasciae, tendons and ligaments. It may stimulate cardiovascular and lymphatic circulation, increasing the supply of nutrients and the removal of toxins. This can improve suppleness and mobility, ease tension and tightness throughout the musculoskeletal system, and reduce inflammation. Canine touch also helps dog to relax. They quickly come to love it and the gentle, nurturing, treatments can be beneficial for dogs with behavioural issues such as phobias, anxiety or lack of confidence. Very friendly helpful all 3 of my dogs love going and they go that extra bit to be caring and have great experience ?? ?